If you are one to fret and labor of the choice of wine to go along side of a dish… fret no longer. Years ago I discovered a dish that offers fool proof opportunity for wine pairings. 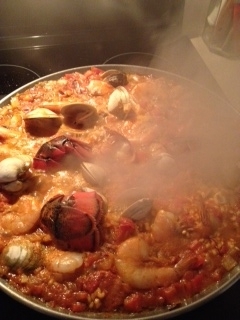 The dish is Spanish paella, and it is one of my favorite dishes for wine. It is a classic dish that combines meat, seafood and poultry into a sumptuous feast for both eye and palate. Wine? Choose Red, White, Rosé or sparkling… you can’t miss. For my first attempt at making paella in my kitchen, I selected a Southern Rhône that I have used at many of our wine tastings. It offers concentration of flavors and texture that matches well against the richness of the dish. My second choice of wine would have been an Albariño from Spain or a Pinot Gris from Alsace. Other choices? Rioja? Sure! Zinfandel… Cru Beaujolais, Barbera, Grenache… yes, yes, yes. You get the idea… stay away from heavy duty Cabs, Classified Bordeaux, and just about everything else should be fine. For Whites stay crisp and/or flavorful… Sancerre, Grüner Veltliner, Viognier, Torrontes, Gavi. I would stay away from the buttery and heavy oaked Chards (but I don’t like those types of Chards for anything)… but if you are in the mood for Chardonnay, open a Pouilly-Fuissé or a modest Burgundy from the Beaune. Rosé? Select and chill. And for sparkling I’m a big fan of Prosecco… Cava from Spain would also suit. Marie-Claude & Pierre Varennes own 7.5ha in Gigondas and Sablet. Pierre Varenne inherited the fields of Gigondas from his parents in 1974 and his wife Marie-Claude inherited the fields of Sablet. The appellation of Sablet was originally classified as a Côte du Rhône Village but with improved quality it is has been awarded its own Village designation. It is located 12 miles to the east of the town Orange. This wine is a typical blend of 70% Grenache and 30% Syrah from wonderful 70 year old vines. The vineyard is sand, alluvium, calcaire and chalk. The word Sablet is the French word for sand. Sablet shares its soils with the neighbouring Gigondas Appellation. The Dentelles de Montmirail foothills rise sharpley just to the east of Sablet and offer a small area of south-facing limestone-based slopes where some of the more successful Sablet vineyards are situated. This is where you will find Boujassot’s vineyard, which has perfect sun exposure and drainage to make great red wine. The wine has an absolutely killer nose, rich and dense with berry fruit and glorious concentration on the palate, awesome richness, great texture that only the best Southern Rhône possess. There are a plethora of paella recipes. The ingredients and variations seem endless. I settled on using the recipe that came with the 15” paella pan that I ordered. The pan is key. Add broth, paprika and saffron to a pot, cover and heat. In a separate 15” paella pan, add 2 tbsp olive oil and brown the chicken pieces and the chorizo, about 5 minutes, Remove. Add the remaining olive oil and cook the onions over medium high heat until translucent, about 5 minutes. Add the tomatoes and garlic and simmer another 5 minutes until they have a “sauce” like appearance. Add sea salt and pepper to taste. Pour in rice and stir until the rice is covered with the tomato mixture (known as sofrito). Add the chicken and chorizo pieces. Slowly add the heated broth to the paella. Stir the rice mixture around until it is evenly distributed throughout the pan. Important… do not stir after this point. Simmer for about 10 minutes, then place the shrimp and the clams into the mixture one by one, evenly distributing throughout. Simmer for another 15 minutes, or until the broth has been absorbed, add extra liquid if necessary. Remove from heat, cover lightly with foil and let sit for another 10 minutes. Garnish with piquillo slices and lemon wedges. n.b. I added two lobster tails, split in half lengthwise, and in half again across and introduced to the cooking process when I added the other seafood. After reading other recipes, I learned that some burned rice on the bottom is desirable. When you can smell the “toasting” of the rice, take the pan off the heat and tent the paella with foil ‘til the moisture is absorbed. I loved the charred rice! I didn’t peel or de-vein the shrimp before cooking, although you can. I like peeling the shrimp as I go along (that’s why we have extra napkins at the table!). I will probably make some changes the next go ‘round… replace the chicken stock with water? Go seafood only? We’ll see! Cheers! !